I work out of a 2-car garage that can barely hold one car because it’s filled with woodworking crap, and it’s a brand new car so I don’t want it constantly covered in sawdust, nor do I want the rest of the garage covered in sawdust, which is how it’s been for a while. I use mostly hand tools but I have a bandsaw, miter saw, sanders, etc. and my dust collection system is just me with a leaf blower out an open garage door. So I bought this thing off amazon for about $135 because it got good reviews and was cheap. I hang it on the ceiling, not sure if it’s the optimal spot, but it’s close to where the action is. The photo I include here is an hour after the garage looked like an Arabian dust storm. It’s got a timer – 1, 2 and 4 hours and a remote. You can turn the fan on and off on the machine itself, but the timer function only works via remote. Don’t really care, just pointing that out. I find that the 1 hour setting never gets everything, but if you had a proper DC system (I don’t, like I said) I’m guessing 1 hour might be sufficient to clean the air. This is a pretty small filter, I wouldn’t get it for a large shop. But you could buy 2 for less than 1 small JET and filter almost (not quite) the same amount of air, and perhaps do it faster. And I also wouldn’t get it thinking you can use it as your entire DC system. I read an amazon review from a guy who said while sanding in a one car garage it removes some dust in the air but not all. He didn’t say if he hooked his sander to a DC, but I can’t imagine why you would think this thing would filter the air enough while sanding. That’s not what it’s for. I’ve had it on while working but it’s really something to use after you’re done. And if you run it with the garage door open, it’s useless. Close it, turn it on, leave. Not the solution for everyone, but for me this works great. I got one for Christmas, and I like it a lot. I always wear a dust mask when I work, and use a shop vac attached to my router table but still … Airborne dust lingered until I got this. I also hung it from the ceiling and use the timer. It’s pretty quiet on low, I turn it up to high and leave it going on the timer when I leave my shop. It’s nice to be able to go into the garage or attached shop area and not have a haze of wood dust in the air. It is the “unseen little micron dust that does the damage” but woodworkers from the known and unknow, on this site have a theory/opinion” . But if the Col. is happy – best to him. To others who are concerned about “dust” do your research. Someone gave me one for Christmas as well. Very nice unit,I do like you can set the timer and just forget about it. I did find that the filters can be gotten at the orange box for less than $18 for outer filters. Everywhere else wanted $23 and up. Desert – apparently you cannot read, which is ironic since you’re ostensibly a fan of research. I didn’t buy this to clean out the unseen little micron dust. This is why I thought the amazon reviewer was off base thinking this would help him significantly while sanding. That’s ludicrous. I’m primarily a hand tool woodworker. I specifically said, “I also wouldn’t get it thinking you can use it as your entire DC system.” It’s a superficial cleaner. I know this because I actually did my research. I bought it to keep the large, seen particles off the car and bottled water and Christmas decorations bins and my tools and everything else. Desert – apparently you cannot read, which is ironic since you re ostensibly a fan of research. I didn t buy this to clean out the “unseen little micron dust.” I bought it to keep the large, seen particles off the car and bottled water and Christmas decorations bins and my tools and everything else. It s a superficial cleaner. I know this because I actually did my research. I’m glad that you are happy, but this review does not convince me. Also, it misleads others , should they be gullable to agree with you. I think that you wasted your money, unless you are happy with it. As for your test, why not post before and after photos of “the car and bottled water and Christmas decorations bins and my tools and everything else.” Dude to make these claims, I don’t agree. Ah, I see. So now you’ve dropped the “unseen little micron dust” argument because that was shot down in flames, and it’s time for your new tack – the seen dust. I must take before and pictures in order for you to be convinced. How are you gonna know if my before and after pictures are legit? Do you seriously not understand how easy it is to post misleading photos? That’s about the dumbest way to try to convince you, however it’s an even better way on my end to mislead, which is what you think I’m doing in the first place. Gee, I should have posted some really convincing, misleading photos to make sure people buy this filter. I don’t even know what you want to be convinced of. You clearly disagree it’s a superficial cleaner. Is it a non-cleaner? A $135 box fan? No clue where you’re going with this, which is funny because I’m the one who owns this and you don’t. But you, for some inexplicable reason and with zero evidence yourself, understand what’s going on in my neck of the woods better than I do. Sorry, I’m laughing at the irony (again). I guess I’m dense, I don’t understand Desert Woodworker’s point? Are you saying it is a bad solution compared to XYZ brand because of A, B, and C? If so, can you please solve for the missing variables (it would add to the discussion). For me, it’s made a nice difference and was an economical choice. I’m interested in why you feel it is a bad option. Collecting hazardous dust where it’s coming out of the machine is the best way to protect your lungs. And experts agree that a respirator or a good dust mask is the next best thing. But those feel like a nuisance to some woodworkers, and many turn to ceiling-mounted air filtration units in an effort to clear the air. But other industrial hygienists we spoke to dismissed this argument. “If they’re well-placed and have quality filter media,” industrial hygienist Bob Cashins of Cashins & Associates in Wakefield, Mass., told us, ceiling-hung units “are good for getting rid of the hazardous dust.” If you’re going to use a ceiling-hung filter, manufacturers recommend placing it against a wall, where it can create circular airflow for maximum efficiency. Avoid putting them in middle of the room, above the tablesaw, or above the bench. Again my post was not to denigrate these “roof top” systems but to inform those who are truly concerned about “fine dust”- again if you are happy with your system- best to you. Thanks for the review. I really want something like this to deal with stuff in the air after a session and it would be nice to get someone of trapped so you don’t have that fine layer of sawdust settling on top of things. If this reduces that, then that’s a sufficient use case for me. I mean, seriously, a workshop attached to a garage. Regardless of all other dust collection, unless you have an airlock, you have ambient dust in the air. This means every time you open the door and disturb settled dust, you have dust that can enter your house. If this cleans even a portion of that dust to prevent it from settling down on surfaces, that reduces overall dust in the shop. Mitigation is like safety. There is no one single step. You need a layered approach to solve issues and together all the layers will be better then doing nothing while looking for the perfect solution. Unreal. So you’ve gone from fine dust (which isn’t what this filter is for) to settling dust you can see (which is what this filter is for but you don’t believe) and now back to fine dust (didn’t we cover this already?) The cherry on top is that you can’t even admit what you did. I’m seriously not trying to be a jerk but you wrote that this little review “misleads others , should they be gullable to agree with you. I think that you wasted your money….” If that’s not denigration of this kind of filter, I don’t know what is. You didn’t believe whatsoever that this kind of filter did exactly what I said it did, which is confirmed by another FWW story on filters that you didn't link to: “After all of our testing was completed, it was clear that these air filters did in fact clear the air of the finest wood dust.” FWW later amended that story to say that they did not emphasize enough in the original version of that story that fine dust is a serious problem and that these filters will not remove it. Again, harmful, fine dust was not the point of the FWW story, which I thought was obvious. Maybe they got a bunch of letters from DesertWoodworker. How many times do I have to say that this isn’t a total solution to dust collection? Or that it doesn’t collect fine dust? You and I agree here but I see it doesn’t matter. The reason I didn’t mention all the stuff that’s out there about DC in this review, from Bill Pentz to every FWW or PW story and YT video, etc., is because this review isn’t about DC, in and of itself. Someone who wants to know about dust collection should, as I’ve done and as you’ve done, refer to a lot more than a single product review on LJ. It is about this WEN: does it do what it is supposed to do? Yes. I have one of the expensive Jet units hanging above my woodworking area in a 2 car garage. I turn it on when I make sawdust and it is loud which means I wear ear muffs all the time. I also use a shop vac on my belt and hand sanders and a DC for everything else. I have been disappointed by the amount of “seen” dust that still settles on the various horizontal surfaces. When I check the Jet air cleaner filter it has material on it but there seems to be a lot more material that winds up elsewhere. All in all, I’m less than impressed with this kind of air filter. Steve- Well said; I agree with what you say. This was review was about the machine and not a “forum” on dust. If I were to have a unit like this I would follow the upgrades like Stumby’s video show and explains. Unreal. So you ve gone from fine dust (which isn t what this filter is for) to settling dust you can see (which is what this filter is for but you don t believe) and now back to fine dust (didn t we cover this already?) The cherry on top is that you can t even admit what you did. I m seriously not trying to be a jerk but you wrote that this little review “misleads others , should they be gullable to agree with you. I think that you wasted your money….” If that s not denigration of this kind of filter, I don t know what is. You didn t believe whatsoever that this kind of filter did exactly what I said it did, which is confirmed by another FWW story on filters that you didn t link to: “After all of our testing was completed, it was clear that these air filters did in fact clear the air of the finest wood dust.” FWW later amended that story to say that they did not emphasize enough in the original version of that story that fine dust is a serious problem and that these filters will not remove it. Again, harmful, fine dust was not the point of the FWW story, which I thought was obvious. Maybe they got a bunch of letters from DesertWoodworker. How many times do I have to say that this isn t a total solution to dust collection? Or that it doesn t collect fine dust? You and I agree here but I see it doesn t matter. The reason I didn t mention all the stuff that s out there about DC in this review, from Bill Pentz to every FWW or PW story and YT video, etc., is because this review isn t about DC, in and of itself. Someone who wants to know about dust collection should, as I ve done and as you ve done, refer to a lot more than a single product review on LJ. It is about this WEN: does it do what it is supposed to do? Yes. You gave a partial quote from me “misleads others , should they be gullable to agree with you. I think that you wasted your money….” And I went on to say more, which you did not post. You state a Fine Woodworking article but don’t site it, for the reader to read the actual article . Similar to using a partial quote from me. You say “ I’m seriously not trying to be a jerk” but you state- “Desert – apparently you cannot read”. Then to quote you “an even better way on my end to mislead, which is what you think I’m doing in the first place.” I would like to know how you came to this conclusion. Notice that you did not respond to the Stumpy Nubs link that I posted. I think that this has gone far enough for me- I will quit and concede that my remarks should have been for a “forum” not a “review”. I know mine is doing the job. With my dust collector going full blast on every tool I use, an hour later the filter has taken on the color of whatever wood I’ve been working with. Never fails. And I am not wearing a mask during the hour after I’m done cutting. 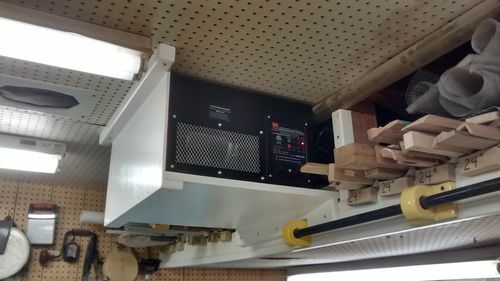 I have one of the expensive Jet units hanging above my woodworking area in a 2 car garage. I turn it on when I make sawdust and it is loud which means I wear ear muffs all the time. I also use a shop vac on my belt and hand sanders and a DC for everything else. I have been disappointed by the amount of “seen” dust that still settles on the various horizontal surfaces. When I check the Jet air cleaner filter it has material on it but there seems to be a lot more material that winds up elsewhere. All in all, I m less than impressed with this kind of air filter.